These shelves are built up on the sides and have a front piece that is grain matched to the cabinet side. When closed they are almost invisible. The smaller shelves are rated at 50 lbs. The larger sizes are rated at 90 lbs. These are pullout shelves similar to keyboard pullouts. They are made deeper for use as equipment platforms or as a place to put papers. These shelves are rated at 150 lbs. 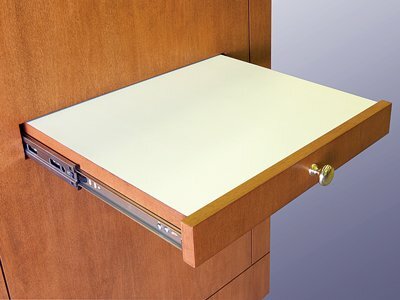 All our lecterns, cabinets and credenzas come with one or two shelves indexed to the shelf pins preventing any slide off. Additional shelves are available for an extra charge.